A board member may not serve more than 8 consecutive years unless approved by an affirmative vote of unit owners representing two thirds of all votes cast in the election or unless there are not enough eligible candidates to fill the vacancies on the board at the time of the vacancy. So, clearly, even if you would now be entering your 9th consecutive year or longer, you can still serve on your board of directors if two thirds of the voters vote for you or if there simply isn’t enough interest by others and an election is not required. I have been asked a thousand times now whether or not this statute applies immediately, meaning does it apply to people who have already served eight years? Or, does it mean that the eight year limitation starts now, and we first worry about this statute in elections starting in 2026? Everyone asks me if the statute is “retroactive.” It is my position, and now the official position of the Division of Condominiums as a result of a new Declaratory Statement, that the statute applies immediately to anyone who is seeking to run in their ninth consecutive year or longer. Applying the statute in this fashion would not be an illegal retroactive application of the statute. This statute does not automatically remove someone in the middle of their ninth consecutive year. That would be considered an illegal retroactive application. On the contrary, this statute regulates the future conduct of elections. But it’s not that simple, and if you’re not confused yet, just wait. While the statute may not be illegal for “retroactivity” reasons as it controls future elections, it may still be unconstitutional in your condominium because going forward it may unconstitutionally change the voting rights of the owners that are outlined and promised to them in the governing documents. In order to teach this complicated topic, let’s discuss a case I argued before the Florida Supreme Court in 2011 called Cohn v. The Grand Condominium, 63 So.3d 1120 (Fla. 2011). The Grand Condominium is a large condominium located in Miami. There are 1,200 units, of which 800 are standard residential condominium units and 400 are commercial units consisting of stores and hotel rooms. Notwithstanding the fact that the residents outnumbered the commercial units 800 to 400 or 2 to 1, the governing documents allowed the commercial unit owners to control a majority of the board of directors. This sounded like great news for the residents at The Grand and residents in other mixed-use condominiums. However, the commercial unit owners filed suit challenging the constitutionality of the new law. They argued that both the United States and Florida Constitutions contain a “contracts clause” that prevents the enactment of new laws that abridge existing contracts. The case went all the way to the Florida Supreme Court. To simplify, the Florida Supreme Court stated that the first thing we need to do is look at the declaration of condominium at The Grand. Does the declaration contain language known as “Kaufman” language which automatically incorporates new condominium laws as they are “amended from time to time” into the declaration, or do the governing documents only adopt the laws as they existed at the time the declaration was recorded and the condominium was built? Unfortunately for the unit owners at The Grand, The Grand’s declaration of condominium only adopted the Florida Condominium Act as it existed in 1986 and did not contain any language showing an intent to adopt future amendments to the Florida Condominium Act. Therefore, the Florida Supreme Court held that the new law guaranteeing the residential owners the right to elect a majority of the board is unconstitutional if applied at The Grand. If, however, the governing documents had the “as amended from time to time” language, the statute would have applied at The Grand and the residential owners would have now been able to elect a majority of the board members. Like the facts in Cohn, this new law alters the voting or election rights of owners in contravention of their governing documents. Those governing documents don’t place a restriction of eight years on one’s ability to serve on the board, but this new law does. Under the typical set of governing documents, you can serve every year, with no limitation, as long as you continue to be an owner of a unit. This new eight-year limit changes that and possibly takes away the right to serve on the board, now requiring you to obtain two-thirds of all votes. Under the same reasoning the Florida Supreme Court gave in the Cohn case, unless your governing documents contain Kaufman or “as amended from time to time” language which indicates an intention to adopt future amendments to the Florida Condominium Act, in my humble opinion it would be unconstitutional to apply this new statute in your condominium. However, if your governing documents do contain this language, the unit owners were always on notice that their voting rights or right to run for the board could be altered by the Florida Legislature, and this new law does apply in your condominium for any election going forward. The bottom line is…this is complicated stuff. If you’re unsure as to how to apply this new law in your condominium, ask your lawyer. Glazer and Sachs P.A. 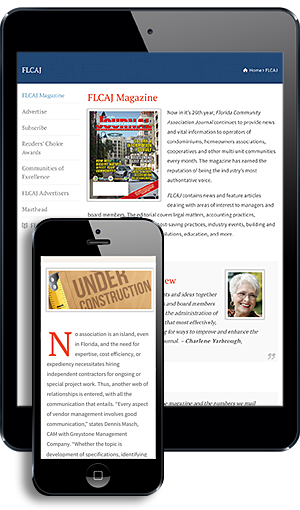 has been representing community associations and their owners throughout Florida since 1994. Our goal is not just to represent you but to educate you along the way. Our devotion is in the numbers, as we have taught our classes to more than 15,000 Floridians throughout the state, spoken to thousands of you on the Condo Craze and HOAs radio show for the past ten years, and written our blog every Monday morning for many years. For more information on Glazer & Sachs, call (954) 983-1112 or visit www.florida-association-law.com.